Nissan’s Armada is all-new for 2017 and unlike the previous generation, it’s not built alongside the Titan pickup in Canton, Miss. 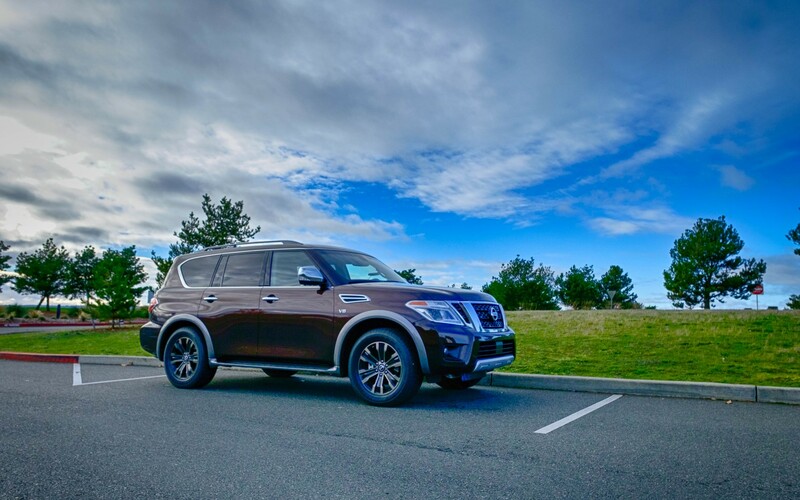 The 2017 Nissan Armada follows the Infiniti QX56/QX80 in ditching Nissan’s full-size truck origins for the Y62 platform that sits beneath the international Patrol and that’s a good thing. The Nissan Patrol is known internationally as a tough off-roader that rivals the likes of the Toyota Land Cruiser, which is enough to pique my interest. When news broke of the Patrol-based Armada earlier this year, I was ecstatic and couldn’t wait to get behind the wheel. I managed to snag a top-of-the-line 2017 Nissan Armada Platinum AWD to drive for a week and it was a wonderful experience. The Armada Platinum rang in at $62k and equipped with the optional second row captain chairs with center console. My first impression of the Armada was simply; “holy crap its huge.” It’s a large SUV with an exterior length of 208.9-inches, beating out the Toyota Sequoia, Ford Expedition and the General Motors triplets by a couple inches. The behemoth weighs in at about 6,000lbs, which isn’t surprising because it’s an old fashion body-on-frame SUV. Drivetrain options include rear wheel drive or all-wheel drive (AWD) powered by Nissan’s 5.6-liter V8 producing 390hp with 394 lb.-ft. of torque backed by a seven speed automatic transmission. While the Nissan Patrol is available with locking differentials, hill descent control and other extreme off-road goodies, the softer Americanized Armada isn’t as fortunate. The only available drive system selector is a simple knob that lets you choose the drive mode – Auto, 4-high or 4-Low — and engage the snow mode for inclement weather. The lack of the extreme off-road options made me sad, but it’s understandable. Nissan is catering the Armada to the mall-crawler crowd that wants luxury and comfort for trips to the mall or their cabin in the woods, which doesn’t require locking differentials. Step inside and you’re treated to a supple leather interior with abundant soft-touch surfaces. Fit and finish of the interior materials is outstanding. The front seats are heated and cooled while the heated steering wheel can burn your fingerprints off with how toasty it gets. Heated seats are available for the second row passengers, too. There’s plenty of room in the car for up to seven passengers, although I’d forgo the optional captain chairs to seat eight. Both rear rows of seats can fold down for more cargo space, but I did find the powered third row annoying. Folding the third row required holding down buttons and until it finished, there wasn’t an automatic mode. It’s not a quick process and I’d prefer manual folding seats for simplicity and quickness. I found the front seats very comfortable for long drives, but didn’t get to test out the rear seats. 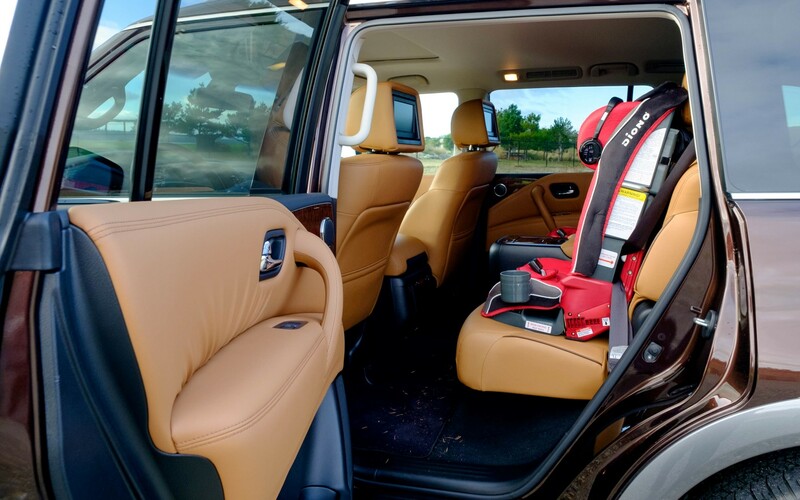 However, I installed a pair of Diono Radian RXT child seats in the middle row for my kids. The middle row seats were wide with spongy foam that made installing the child seats a breeze. Since I could easily put my weight on the seat to push down the foam, it made latching down the seat belt an easier process. Nissan didn’t make any technological breakthroughs with the flagship Armada. 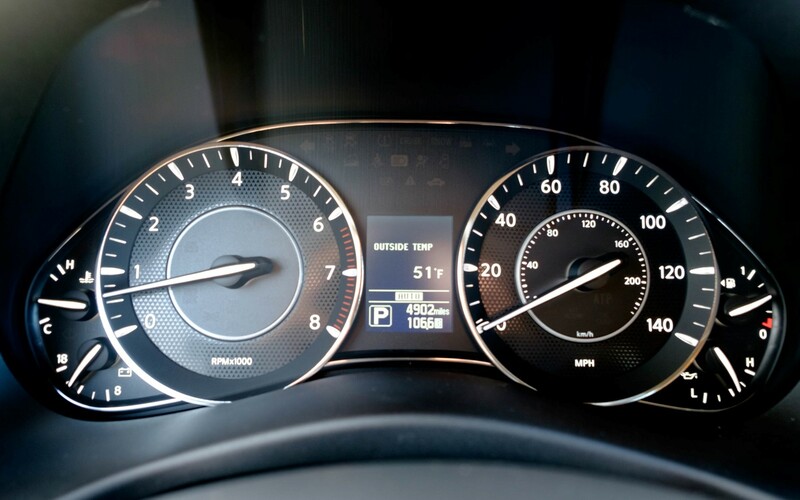 The gauge cluster has traditional analog gauges and a simple black and white display that is no better than a trip meter, which is odd because color LCD displays are available in it’s other vehicles like the Pathfinder, Rogue and Sentra. The infotainment system interface visually resembles the setup that debuted on the 2011 Nissan Leaf – it’s functional but not pretty to look at and lacks support for Android Auto and Apple CarPlay. It’s a basic 8-inch touch screen system that features USB connectivity, Bluetooth audio and SiriusXM, NavTraffic and NavWeather. 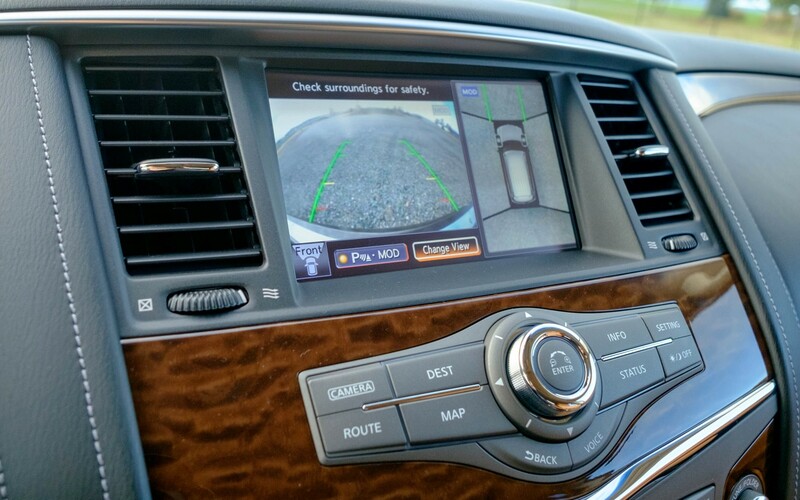 Nissan’s excellent AroundView Monitor (AVM) camera system makes it into the Armada Platinum, however. 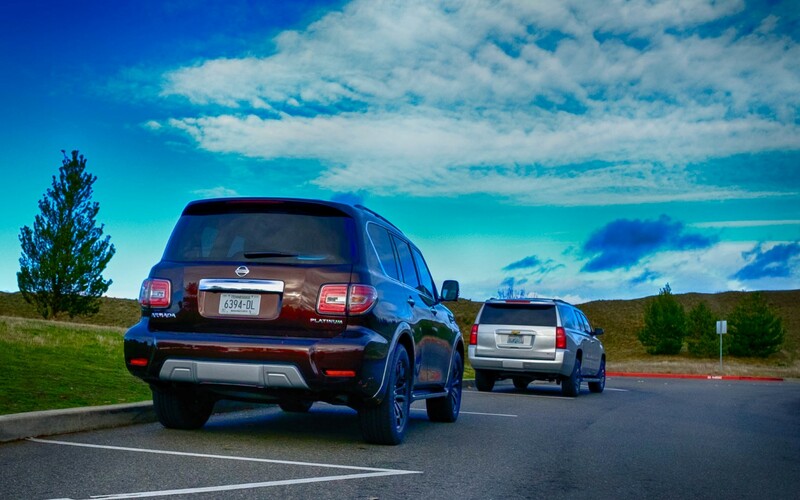 The 360-degree camera system makes backing up and parking the large Armada a breeze. Dual 7-inch head-rest mounted LCDs are available for middle-row passengers. Playback sources include DVD and USB, but file compatibility for USB video playback is limited to DivX and MP4 in an AVI container. It’s unable to playback audio and video via USB simultaneously, so you can either let your kids watch movies or listen to music up front at the same time, unless they’re watching DVDs. Composite video inputs and a power inverter lets you plug in game consoles and movie players. HDMI isn’t an option so be prepared to buy new video cords to connect your Xbox One, PS4 or WiiU to the Armada. The power inverter only has a 2-prong plug, so you’ll need an adapter if your power cord requires ground. A full suite of driver assists is standard on the Armada Platinum. Nissan includes forward collision warning (FCW), forward emergency braking (FEB), lane departure warning (LDW), lane departure prevention (LDP), blind spot warning (BSW), blind spot intervention (BSI), backup collision intervention (BCI) and moving object detection (MOD). The alphabet soup of driver assists lets the car automatically stop to prevent an accident or minimize the impact in all directions or simply sound off alerts when a collision may occur. While I’m a big fan of the BSW systems, the LDW and LDP aren’t so good. The LDW only sounds an annoying warning when you get too close to the lane marker whereas the LDP can only apply the brakes to help steer the car towards the center of the lane. Its not as advanced as some of the newer systems from Toyota, Honda and Mercedes-Benz that can actively steer the car for you, so it may help for the few times you reach for your Slurpee and let the car veer towards the lane marker, but doesn’t make highway commutes more tolerable. Full-speed adaptive cruise control (ACC) is standard on the Armada Platinum, which makes it a fantastic road trip car. The ACC automatically speeds up and slows down the car, even taking it to a complete stop, which makes heavy traffic much more tolerable. Despite the technological shortcomings of the Nissan Armada Platinum, I absolutely adore it. The powertrain is buttery smooth and the car handles as well as it can for it’s size. Each bump in the road was absorbed by the suspension and the supple leather seats provide excellent comfort for short and long drives alike. It may be psychological because I am a fan of utilitarian vehicles like the Nissan Patrol it’s based on, but the Nissan Armada Platinum is a pleasure to drive. Large SUVs like the Chevy Tahoe, Toyota Sequoia and Ford Expedition aren’t usually my forte, but the Armada is a unique vehicle that I’ve taken a liking to because of it’s global heritage and capabilities. 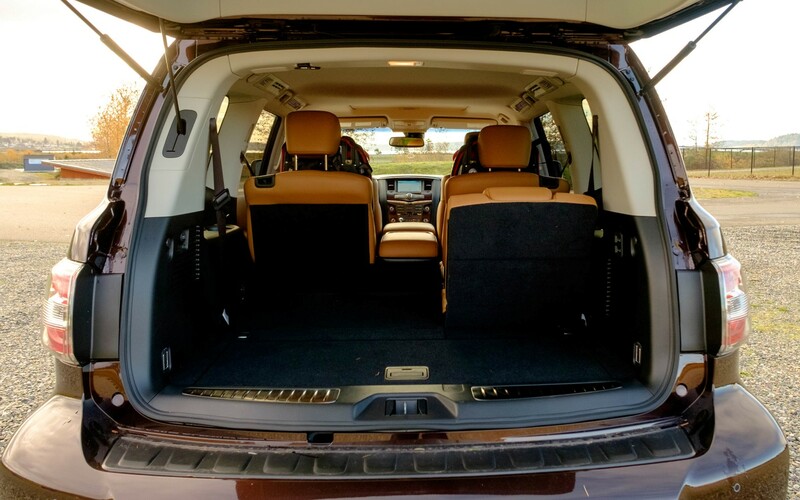 If you’re looking for a luxurious SUV with room for seven or eight passengers, you can’t go wrong with the Nissan Armada Platinum. It may lack Android Auto and Apple CarPlay support, but the Armada is a unique vehicle for those that want to stray from the sea of GM and Ford SUVs. The $61k Armada Platinum is the top trim level, but I’d personally go for an SL-trim with the technology package to forgo the ancient rear seat entertainment system and save $5,000.